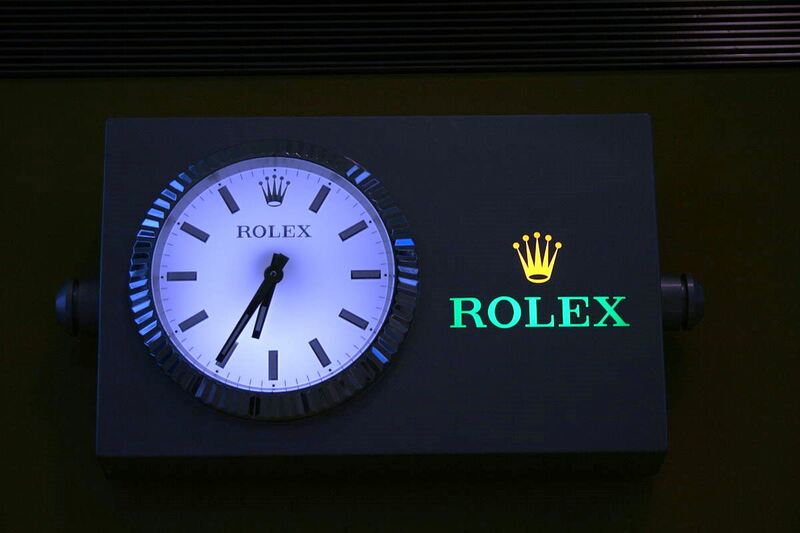 Nothing says time-honored elegance and luxury more than a Rolex wristwatch. Rolex is not only the most highly searched and popular watch brand in the world, it also holds the distinction of being one of the very few watch brands that best holds it value over time. It’s no wonder Rolex wristwatches are among the most highly coveted and requested timepieces during the Christmas gift-giving season. You’ll find a wide array of Rolex men’s and women’s wristwatches at World of Watches from our impressive collection of pristine pre-owned timepieces. 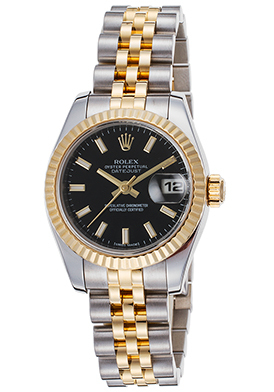 Each pre-owned Rolex watch available at World of Watches is expertly restored with original manufacturer parts and each also passes a comprehensive 30-point inspection too. 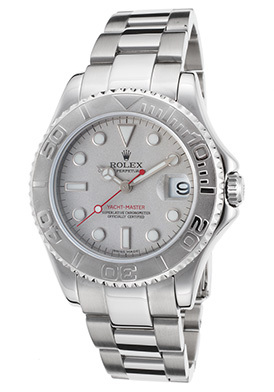 What’s more, a comprehensive assessment of any of the watch’s exterior blemishes is provided in the product description and each Rolex watch at World of Watches comes with a 2-year limited warranty. 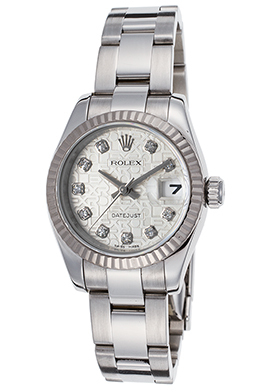 The Rolex Datejust Diamond watch for women is an excellent gift selection in premium grade stainless steel. This Swiss-made automatic women’s watch has been awarded official Chronometer certification by the COSC (Official Swiss Chronometer Test Institute). The signature Oyster case in stainless steel has a lustrous mirror-bright finish and is presented on the classic Oyster bracelet in brushed and polished stainless steel. The signature Rolex raised fluted bezel surrounds the tone-on-tone emblematic silver colored dial with silver-tone sword hands and ten shimmering inlaid diamond hour markers. A magnified Cyclops window at the 3 o’clock hour reveals the automatic date calendar. The polished, screw-down stainless steel crown with fluted detail adds distinction. Features include a glare-proof, scratch resistant sapphire crystal above the dial and water-resistance to 100 meters or 330 feet. The Rolex Datejust Diamond women’s watch is 26mm in diameter and 11mm thick. The Rolex Oyster Perpetual Datejust Automatic Watch offers a highly distinguished profile for men in 18K yellow gold and stainless steel. This precision crafted automatic man’s watch features official Chronometer certification and has a handsome Tonneau shaped case in premium grade stainless steel, highly polished to a lustrous patina. The Rolex Jubilee multi-link bracelet in brushed stainless steel with polished 18K yellow gold links adds to the prestigious design. The signature fluted bezel in 18K yellow gold surrounds the champagne gold colored dial with polished yellow gold-tone sword hands, raised Roman numeral hour markers and a magnified Cyclops date window at the 3 o’clock hour. Features include a glare-proof, scratch resistant sapphire crystal above the dial, along with a locking screw-down crown and case back for water-resistance to 100 meters or 330 feet. 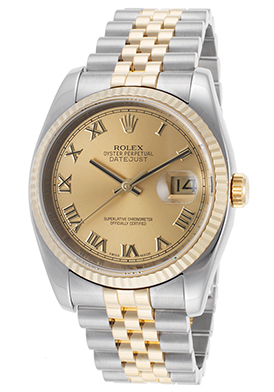 The Rolex Oyster Perpetual Datejust Automatic men’s watch is 36mm wide and 12mm thick. The Rolex Oyster Perpetual Datejust Automatic watch for women offers a highly accomplished profile for today’s female in 18K yellow gold and premium grade stainless steel. This captivating Swiss-made women’s watch features precision automatic movement inside and official Chronometer certification. The signature contoured round case in polished stainless steel is presented on the Rolex Jubilee bracelet in brushed stainless steel with highly polished 18K yellow gold center links. The polished 18K yellow gold crown with fluted detail adds to the stylish good looks. The signature polished, raised fluted bezel in 18K yellow gold encircles the legible black dial with gold tone baton hands and gold-tone outlined, luminous baton hour markers. A window at the 3 o’clock hour reveals the automatic date calendar. The anti-reflective, scratch resistant sapphire crystal covers the dial. Features include a locking screw-down crown and case back for water-resistance to 100 meters or 330 feet. The Rolex Oyster Perpetual Datejust Automatic women’s watch is 27mm in diameter and 10mm thick. The Rolex Yacht-Master Automatic Watch in premium grade stainless steel and platinum is an extraordinary selection for either men or women. This exemplary crafted unisex, midsize timepiece features the contoured round case crafted in highly polished Rolesium, a patented metal made of premium grade stainless steel and platinum. The outstanding triple-link bracelet in brushed and polished stainless steel adds to the striking good looks. The bidirectional rotating bezel crafted in premium platinum features a distinctive coin-edge rim and raised markers on the center ring. The matte silver-colored dial shines with luminous pie-cutter hands, luminous cabochon dot and baton hour markers, along with a magnified Cyclops date window at the 3 o’clock hour. Features include a glare proof scratch resistant sapphire crystal above the dial, along with a locking screw-down crown and case back for water-resistance to 100 meters or 330 feet. The Rolex Yacht-Master automatic watch is 35mm in diameter, 12mm thick and has been awarded official chronometer certification by the COSC. Free shipping and free returns are included on all domestic men’s and women’s watch purchases within the continental United States at World of Watches. Rolex outdoor billboard image courtesy of Wiki Commons. Invicta Weekender: Up To 90% Off On All Invicta Styles All Weekend Long! These are oustanding watches. I wish that they would be a little big cheaper.